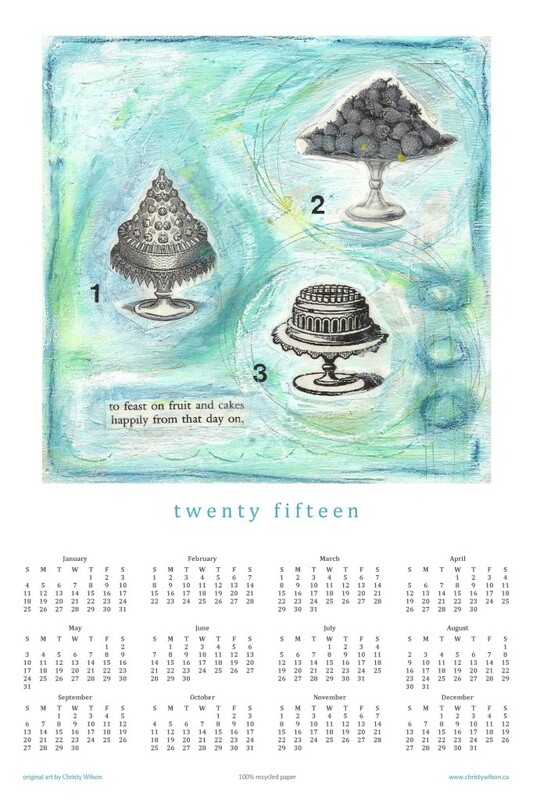 As we draw towards the end of another amazing year, it is time for me to get my 2015 poster calendars ready for you! They make great holiday gifts — just roll up, tie with ribbon, and pass along with your love and best wishes for the coming year. 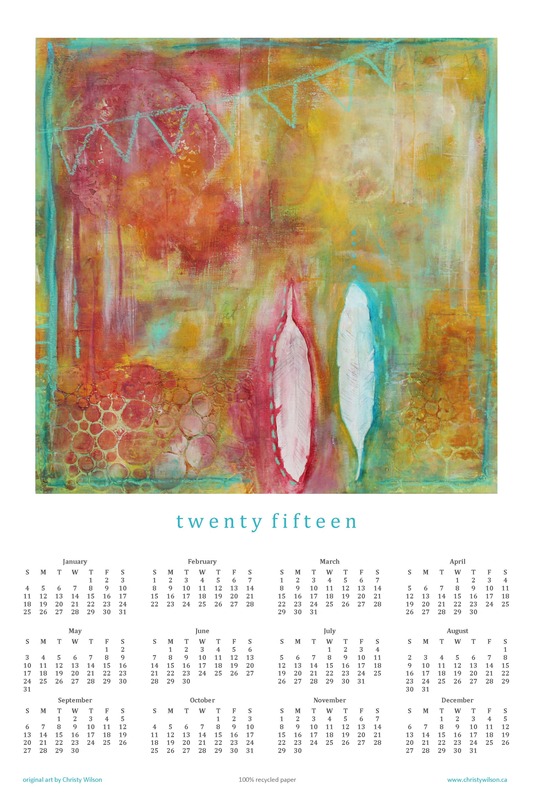 My calendars are big and bold (12 x 18 inches) and printed locally on 100% recycled paper (good for you AND the earth) and are available in my etsy shop, at Artzi Stuff in downtown Nanaimo, or at the Pier Gallery Christmas Sale here on Gabriola on December 13 and 14th. Or contact me directly to place an order (I offer bulk discounts so let me know if you want a bunch). Which one do you like the best? 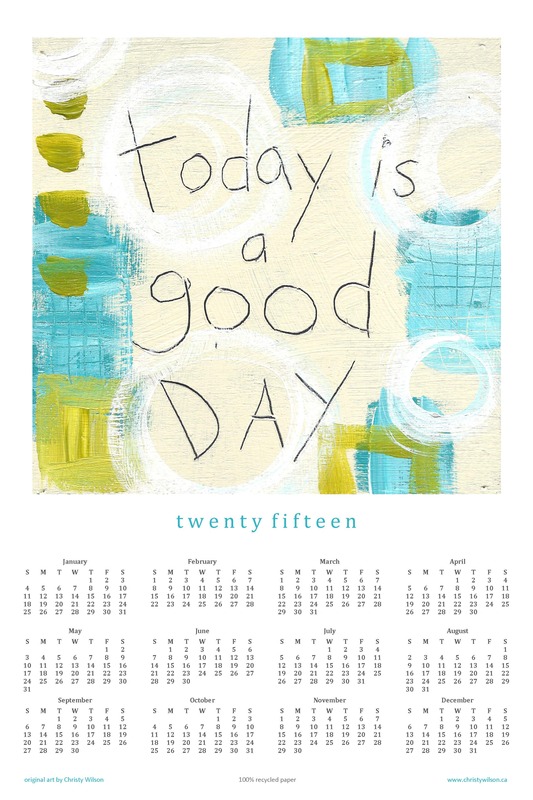 Perhaps you cannot decide….if so, just get a couple and make sure both your home and office have a fun calendar on the wall. 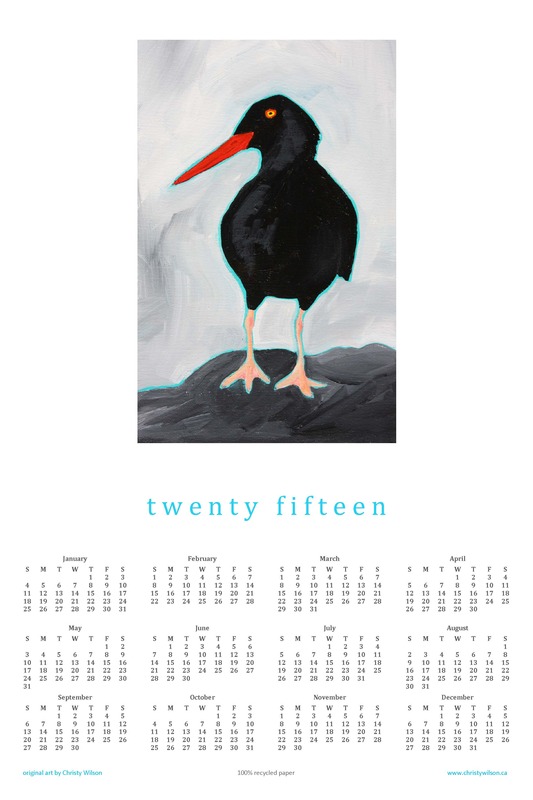 and introducing a slightly different style for the new year (with the help of some cheeky oystercatchers)…. Here’s hoping 2015 is full of happy days for you and yours! P.S. which is your favourite 2015 design? 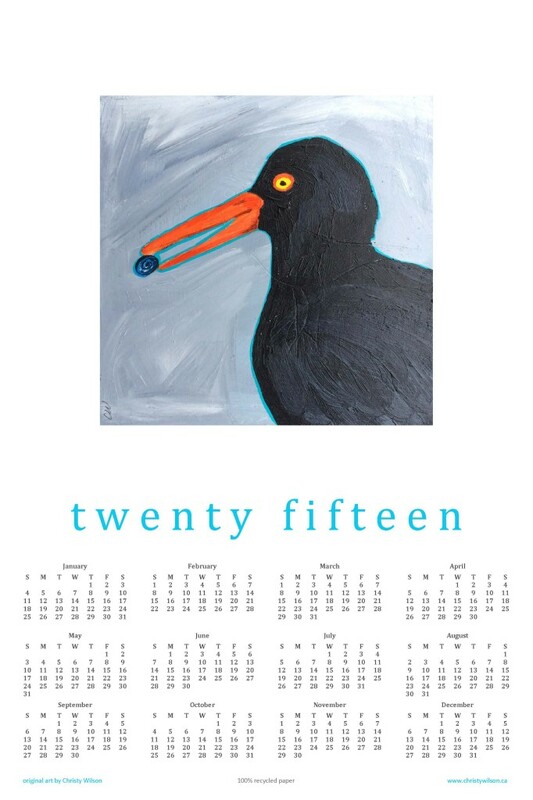 This entry was posted in Uncategorized and tagged 2015, cake, calendar, Christmas sale, craft sale, feather, fruit, gallery, good day, oystercatcher, painting, year at a glance, year at a glance calendar by admin. Bookmark the permalink. I love these paintings–they are gorgeous to look upon as we move towards this new year and beyond. So fabulous! thank you so much for your sweet words, for your ongoing support! She does look rather perky for such a foggy morning, doesn’t she?! Thanks Christy, we’ve got the oyster catcher in the office, the feathers on the fridge and everyone who got one as a gift even Russ & Court loved ‘em!